Note: To celebrate the 20th anniversary of the Hubble Space Telescope, for ten days, Universe Today will feature highlights from two year slices of the life of the Hubble, focusing on its achievements as an astronomical observatory. Today’s article looks at the period April 2002 to April 2004. As I mentioned yesterday, Hubble servicing mission 3B in March 2002 saw the successful replacement of the Faint Object Camera with the Advanced Camera for Surveys (ACS). Surveys, surveys, and yet more surveys; astronomers are forever spending huge amounts of time doing surveys. And from its name you’d not be wrong to guess that a great deal of ACS’ time has been devoted to surveys. Perhaps the best known – to astronomers anyway – is GOODS, which stands for the Great Observatories Origins Deep Survey. It was kicked off in late 2001, and is still on-going; in addition to hundreds of hours of observations by the most powerful ground-based facilities and Hubble’s ACS, an awful lot of time on Spitzer, Chandra, XMM-Newton, and Herschel has been devoted to it (I’ll cover GOODS in more detail later; for now, here’s a link to the project’s website). Shortly after the ACS went into operation, the world was treated to a sample of stunning images from it. My favorite is ‘the Mice’ (NGC 2676); what’s yours? Oh, and that galaxy collision? We imagine that the Space Telescope Science Institute (STScI) is devoted exclusively to the Hubble, both its scientific work and its public outreach and education. Sometimes however the work goes a bit beyond that, and combines both science and outreach. A good example of this is the video at the top of this article; Dr. Frank Summers, an STScI astrophysicist, took research simulation data from Case Western Reserve University’s Chris Mihos and Harvard University’s Lars Hernqvist and visualized it using the same software that Hollywood uses to produce blockbuster visual effects. Special care was taken so that what appears onscreen accurately reflects what was calculated in the simulation. How good is ACS? Judge for yourself; the image of Uranus’ moons above is from ACS, compare it to the WFPC2 one, in Hubble’s 20 Years: Now We Are Six article (Universe Today’s story on this is Hubble Finds Two Small Moons Around Uranus). 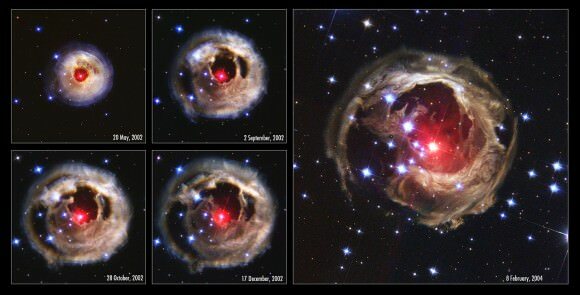 Hubble’s superb resolution, close to the theoretical best for its new instruments (and old ones, using COSTAR), gives us spectacularly detailed images (and oodles of data) for such transient events as the flare-up on the star V838 Mon, lighting up the surrounding gas and dust and giving us much better understanding of the interstellar medium. As you’ve no doubt already concluded, the Hubble helped our understanding of planetary nebulae greatly; but, as is always the case in an active field of science, new observations sometimes bring new questions. Such is the case of Henize 3-1475, the ‘garden sprinkler’ nebula (Puzzling Jets Seen Blasting Out from a Nebula is Universe Today’s story on this). Some gravitational lenses produce images which can be analyzed using observations from ground-based telescopes. Generally, however, the Hubble produced by far the best data … and stunning images (Abell would have been astonished; he died in 1983, only a few years after the first astronomical lens was discovered, the ‘twin QSO’; it looks nothing like this). Note: To celebrate the 20th anniversary of the Hubble Space Telescope, for ten days, Universe Today will feature highlights from two year slices of the life of the Hubble, focusing on its achievements as an astronomical observatory. Today’s article looks at the period April 2000 to April 2002. The International Center for Photography gave its 2000 Infinity Award to the Hubble Heritage Project, in the Applied Photography section. And what did that team choose to showcase their award? The above image of NGC 3314! Clearly the Hubble has had a deep impact far beyond the astronomical community and space fans. Columbia’s last flight, before the one that ended in disaster, was STS-109, or the Hubble servicing mission 3B, in March, 2002. In terms of imaging capability, it was the most dramatic; the Advanced Camera for Surveys (ACS) was installed (replacing the Faint Object Camera), and NICMOS’ cooling system was replaced (giving the Hubble ‘night vision’ again – it could see in the infrared once more). I’ll be covering the cornucopia of science results from ACS in later articles. My pick for the Hubble image most of you, my readers, would put at the top your ‘what I remember from these two years’ is Stephan’s Quintet. What we see on a webpage or in a magazine, when we look at a Hubble image, resembles a photograph. What an astronomer sees is data, glorious data, in all its numerical detail (astronomers even invented a special file format for their data, called FITS, short for flexible image transport system; more about it here). And among the most critical aspect of astronomical data is its calibration, e.g. the function which relates pixel values to things like flux (which may be measured in janskys, or ergs per second per square meter per hertz). But how do you calibrate an instrument that’s aboard the Hubble? You turn to the Instrument Physical Modelling Group, part of the Space Telescope European Coordinating Facility! This highly specialist team actually models the Hubble’s instruments, in software, from first (physics) principles, and from those models produces robust software for taking the raw data from a Hubble instrument and producing calibrated, science-grade data. They then make their results public, for anyone and everyone to use; for example the Faint Object Spectrograph Post-Operational Archive (you can read the details of their work in ST-ECF Newsletter 29). Another behind-the-scenes activity is the production of the Hubble Guide Star Catalog, essential for the Hubble’s smooth operation (and a major boon to amateurs); 2001 saw a major new release (II). Every now and then a (faint) star will pass close to the line of sight of a more (bright) distant star, and we will see the (distant) star brighten in a characteristic way (due to gravitational lensing). One kind of such lensing is the object of many astronomers’ desire, a MACHO (massive compact halo object); even more desirable is to see both the lensed and lensing stars, as separate points of light, some time after the event. Hubble observed just such a rarity. Comets are fragile things; their very tails tell tales of constant erosion at the hands of sunlight. And when they die, do they do so with a bang, or merely a whimper? Hubble captured an example of the latter (Comet LINEAR is no more). But the Hubble isn’t only for astronomers, even amateur astronomers; it’s there for us all, to take pictures that awe and inspire us. And by popular demand, the famous Horsehead nebula, as never seen by anyone using a telescope down here on Earth. Last week’s Universe Puzzle was fun to do wasn’t it? Well, this week’s is number ten (how time flies), which is a good time to get some feedback. Do you enjoy these puzzles? What do you particularly like? Dislike? Would like to see changed? Would like to see more of? Let me know please! Either in the comments below, or drop me an email. What is brightest pre-telescopic nova? As in: a nova before telescopes were used to observe the heavens. This puzzle was designed to really cudgel your brains! As several of you noted, the term ‘nova’ has had different meanings through the ages; specifically, it wasn’t until the 20th century that ‘novae’ were distinguished from ‘supernovae’. So in trying to solve the puzzle, do you look for historical ‘novae’ but not ‘supernovae’? Or both? Then there’s the fact that what might have been called a ‘nova’ in the writings of someone in Europe (writing in a language close to, or derived from, Latin) may have been called something quite different by someone writing in China, or in Arabic … even though they were describing the exact same ‘new star’ in the sky. But then not every ‘guest star’ (a translation of a Chinese term) was a nova. There’s more: I didn’t say it had to be nova that was recorded; there has been some success these last few years in finding light echos of ancient supernovae and extrapolating back. Perhaps someone has done this and someone determined that there would have been a particularly bright nova in 1234 (say), but because it was near the south celestial pole, it was highly unlikely to have been recorded by anyone (in a form that we could understand today) – no, this is highly unlikely, but you get the point. Getting a little more imaginative: some GRBs are visible to the unaided eye. However, as they are visible for just a few seconds, tops, they’d likely not be recorded. Now the answer that I had in mind, taking all the above (and more; SGRs, Cataclysmic Variables, Dwarf Novae, Recurrent Novae, …) in account was SN1006, which is the historical (super)nova that is both reliable and has the highest estimated peak brightness. Hon. Salacious B. Crumb , congratulations! You get an extra prize for looking into the known SNR (supernova remnants) to see if any had an estimated peak brightness greater than that of SN1006. And of course “there’s no way to know” is, perhaps, the best answer of all! Note: To celebrate the 20th anniversary of the Hubble Space Telescope, for ten days, Universe Today will feature highlights from two year slices of the life of the Hubble, focusing on its achievements as an astronomical observatory. Today’s article looks at the period April 1996 to April 1998. The ability of the Hubble Space Telescope to be serviced by astronauts, using a space shuttle as a platform, is one of its design features. This proved its worth very early, with the first servicing mission installing COSTAR. The second such mission – a ten day effort with Discovery as the workhorse – took place in February 1997; two new instruments were installed (and two removed), the Near Infrared Camera and Multi-Object Spectrometer (NICMOS) and the Space Telescope Imaging Spectrograph (STIS), and many other, smaller, upgrades and repairs made. Yesterday’s article featured the Pillars of Creation; today’s captures the beauty of a star’s death. How does the Hubble work? Who runs it? The Space Telescope Science Institute (STScI) is responsible for the scientific operation of Hubble as an international observatory; it has a combined staff of approximately 500, of whom approximately 100 are PhDs. Among the prime tasks of the STScI are the selection of the Hubble observing proposals, their execution, the scientific monitoring of the telescope and its instruments and the archiving and distribution of the Hubble observations. The Space Telescope-European Coordinating Facility (ST-ECF) offers support for the preparation of Hubble observing proposals and the scientific analysis of observations. It also operates the Hubble Science Archive, which makes data available to the astronomical community via the Internet. With the exception of observations like the Hubble Deep Field – which are available for immediate release – the data from Hubble observations are the exclusive property of the observers for one year, after which all scientific data are made available to anyone and everyone, via the internet. And guess what? Thousands of papers have been published, using such freely available data! One example of the tremendous value of the Hubble archive is all the asteroids it inadvertently images; because of the Hubble’s sensitivity, motion, and resolution, the orbits of many of these can be determined from just the serendipitous images (discoveries made by ground-based telescopes usually require follow-up images days apart). And yes, many papers have been written, based on these images, “Asteroid Trails in Hubble Space Telescope” for example. Sometimes something happens in the sky and you want to point powerful telescopes at it, quickly, before it disappears. By far the most interesting yet fleeting ‘something’ is gamma-ray bursts (GRBs). Although known for decades, none had been seen in any other electromagnetic waveband … until February 28, 1997. Right after its servicing mission, Hubble caught the afterglow of GRB 970228, located in very distant galaxy. A milestone in astronomy. Volcanoes, active ones, were discovered on Io, by accident, in 1979, as volcanic plumes rising above the limb. Who could have imagined that such plumes would be imaged not twenty years later, from low-Earth orbit, with Jupiter as the backdrop? 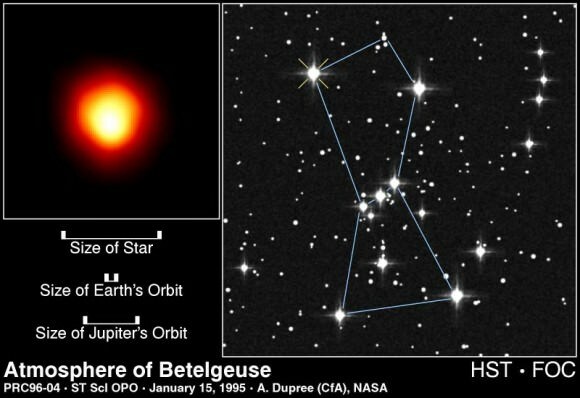 In 1920 Betelgeuse’s diameter was estimated, using a 6 meter interferometer mounted on the front of the 100-inch Mount Wilson telescope. 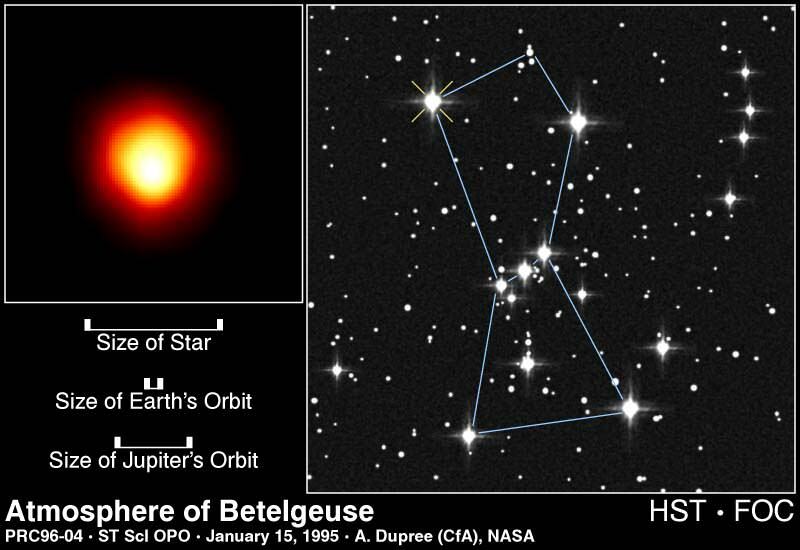 In 1996, the Hubble made a direct observation of Betelgeuse, resolving it; only the second star to have ever been seen as anything but a point of light (what was the first?). The Antennae galaxies, NGC 4038/NGC 4039, are not only highly photogenic (how many amateurs count their snaps of these among their most prized? ), but great natural laboratories for studying galaxy collisions, star formation, etc. Hubble’s 1997 images provided the basis for hundreds of papers. Note: To celebrate the 20th anniversary of the Hubble Space Telescope, for ten days, Universe Today will feature highlights from two year slices of the life of the Hubble, focusing on its achievements as an astronomical observatory. Today’s article looks at the period April 1994 to April 1996. After the famous Apollo 8 “Earthrise” image, comet Shoemaker-Levy 9’s impact with Jupiter, in July 1994, strikes us as the most stark reminder of the fragility of our home. And the Hubble gave us the clearest pictures of just how destructive that collision was; those dark blotches are bigger than the Earth. Equally memorable, from Hubble’s early childhood years – ages five and six – is the “Pillars of Creation” image. Much of the Hubble’s time in the first few years was devoted to the Hubble Space Telescope Key Projects, two of which I mentioned yesterday, “on the Extragalactic Distance Scale”, and the “Quasar Absorption Line” Key Project. There is a third, the Medium-Deep Survey (MDS), lead by Richard Griffiths, who is now at Carnegie Mellon University. Here’s a nice bit of trivia: astronomers spend an inordinate, a humongous amount of time doing surveys; they even build entire observatories devoted exclusively to them (think Sloan Digital Sky Survey, of Galaxy Zoo fame)! And here’s a question for you: why? Why are surveys soooo important to astronomers? Anyway, MDS is interesting for another reason too; it’s a “parallel mode” project … while the Hubble is pointed at its main target, a nearby field is also observed, using WF/PC or the Faint Object Camera (or, later, WFPC2); two results for the price of one! However, perhaps more than any other observations, the MDS ones before the Hubble had its vision fixed (see yesterday’s article) suffered from the mis-figuring of the primary mirror. And it’s a tribute to the ingenuity and perseverance of Griffiths and his colleages that they were, eventually, to wring so much good science from the data (you guessed it, hundreds and hundreds of papers). Jupiter wasn’t the only solar system object of interest to Hubble; Uranus, its rings and inner moons captured on film (well, CCD); the first surface features on Pluto were snapped; Saturn’s Aurorae imaged; the Galilean moons of Jupiter mapped; etc, etc, etc. My own favorite Hubble recollection from these two years is (another!) paper by John Bahcall, “M dwarfs, microlensing, and the mass budget of the Galaxy“, which basically proved that the Milky Way’s halo is composed principally of non-baryonic dark matter. I remember reading it and thinking, “nah, that can’t be right, you guys can’t conclude that from that data!”, but the more I gnawed at it, the more it struck me just how simple, yet profound, this work was (pay attention you fans of Universe Puzzle, there’s a clue to a future puzzle here). Finally, towards the end of the time I’m covering in this article, Hubble took the famous Hubble Deep Field. The version posted here you may not have seen before, because it uses a different color transform, by Robert Lupton (more images using this technique here). Using their backyard telescope, today? No; however, this image of three exoplanets required just 1.5 meters (diameter; 60 inches) of a telescope mirror, not vastly larger than the biggest backyard ‘scope. These particular exoplanets orbit the star HR 8799, and have been imaged directly before, by one of the 10-meter (33-foot) Keck telescopes and the 8.0-meter (26-foot) Gemini North Observatory, both on Mauna Kea in Hawaii; they are among the first to be so imaged, as reported by Universe Today in November 2008 First Image of Another Multi-Planet Solar System. So how did Gene Serabyn and colleagues manage the trick of taking the image above, using just a 1.5-meter-diameter (4.9-foot) portion of the famous Palomar 200-inch (5.1 meter) Hale telescope’s mirror? They did it by working in the near infrared, and by combining two techniques – adaptive optics and a coronagraph – to minimize the glare from the star and reveal the dim glow of the much fainter planets. “Our technique could be used on larger ground-based telescopes to image planets that are much closer to their stars, or it could be used on small space telescopes to find possible Earth-like worlds near bright stars,” said Gene Serabyn, who is an astrophysicist at JPL and visiting associate in physics at the California Institute of Technology in Pasadena. The three planets, called HR8799b, c and d, are thought to be gas giants similar to Jupiter, but more massive. They orbit their host star at roughly 24, 38 and 68 times the distance between our Earth and the Sun, respectively (Jupiter resides at about five times the Earth-Sun distance). It’s possible that rocky worlds like Earth circle closer to the planets’ homestar, but with current technology, they would be impossible to see under the star’s glare. The star HR 8799 is a bit more massive than our sun, and much younger, at about 60 million years, compared to our sun’s approximately 4.6 billion years. It is 120 light-years away in the constellation Pegasus. This star’s planetary system is still active, with bodies crashing together and kicking up dust, as recently detected by NASA’s Spitzer Space Telescope. Like a fresh-baked pie out of the oven, the planets are still warm from their formation and emit enough infrared radiation for telescopes to detect. To take a picture of HR 8799’s planets, Serabyn and his colleagues first used a method called adaptive optics to reduce the amount of atmospheric blurring, or to take away the “twinkle” of the star. For these observations, technique was optimized by using only a small fraction of the telescope was used. Once the twinkle was removed, the light from the star itself was blocked using the team’s coronograph, an instrument that selectively masks out the star. A novel “vortex coronagraph,” invented by team member Dimitri Mawet of JPL, was used for this step. The final result was an image showing the light of three planets. While adaptive optics is in use on only a few amateurs’ telescopes (and a relatively simple kind at that), the technology will likely become widely available to amateurs in the next few years. However, vortex coronagraphs may take a bit longer. “The trick is to suppress the starlight without suppressing the planet light,” said Serabyn. The technique can be used to image the space lying just a few arcseconds from a star. This is as close to the star as that achieved by Gemini and Keck – telescopes that are about five and seven times larger, respectively. Note: To celebrate the 20th anniversary of the Hubble Space Telescope, for ten days, Universe Today will feature highlights from two year slices of the life of the Hubble, focusing on its achievements as an astronomical observatory. Today’s article looks at the period April 1992 to April 1994. Without a doubt, Servicing Mission 1 in early December 1993 was the high point of the Hubble Space Telescope’s third and fourth years in space. For starters, it successfully replaced the high speed photometer instrument with COSTAR (Corrective Optics Space Telescope Axial Replacement), which, as its name implies, corrected for the mis-figured primary mirror and so permitted the three instruments not replaced to make the high quality images intended (they were the Faint Object Camera, the Faint Object Spectrograph, and the Goddard High Resolution Spectrograph). It also replaced the WF/PC (Wide Field Planetary Camera) with an upgraded WF/PC (called WFPC2), and made several other repairs and replacements which considerably improved the Hubble’s performance and robustness. Well before the Hubble was launched much of its observing time was pre-allocated, especially to two Hubble Key Projects, “on the Extragalactic Distance Scale”, and the “Quasar Absorption Line” Key Project. The former is well-known (and I’ll cover it in a later Hubble 20th birthday article); the latter hardly known at all outside the astrophysics community. It was the brainchild of the remarkable John Bahcall, and much of the Hubble’s time in its first four years was devoted to it. There are 13 main papers on its results, with hundreds more based on them. In a word, this project revolutionized our understanding of the space between galaxies and galaxy clusters, all the way from just beyond the Milky Way to billions of light-years distant. It wasn’t only professional astronomers who used the Hubble in these two years; 16 amateurs did too! Do you know what they found? If you had the chance, what would you use the Hubble to observe? Perhaps the most captivating images the Hubble took in these two years are the ones of Comet Shoemaker-Levy 9 on its way to a collision with Jupiter (I’ll cover the collision itself tomorrow). Do you remember, back then, that asteroid and comet threats to life on Earth just became a whole lot more believable? Hubble sent back images of many more objects in these two years, including a much better one of eta Carinae (compare this one with the one in yesterday’s article) and the optical jet of the iconic quasar 3C273. The strength of the magnetic fields here on Earth, on the Sun, in inter-planetary space, on stars in our galaxy (the Milky Way; some of them anyway), in the interstellar medium (ISM) in our galaxy, and in the ISM of other spiral galaxies (some of them anyway) have been measured. But there have been no measurements of the strength of magnetic fields in the space between galaxies (and between clusters of galaxies; the IGM and ICM). But who cares? What scientific importance does the strength of the IGM and ICM magnetic fields have? Estimates of these fields may provide “a clue that there was some fundamental process in the intergalactic medium that made magnetic fields,” says Ellen Zweibel, a theoretical astrophysicist at the University of Wisconsin, Madison. One “top-down” idea is that all of space was somehow left with a slight magnetic field soon after the Big Bang – around the end of inflation, Big Bang Nucleosynthesis, or decoupling of baryonic matter and radiation – and this field grew in strength as stars and galaxies amassed and amplified its intensity. Another, “bottom-up” possibility is that magnetic fields formed initially by the motion of plasma in small objects in the primordial universe, such as stars, and then propagated outward into space. So how do you estimate the strength of a magnetic field, tens or hundreds of millions of light-years away, in regions of space a looong way from any galaxies (much less clusters of galaxies)? And how do you do this when you expect these fields to be much less than a nanoGauss (nG), perhaps as small as a femtoGauss (fG, which is a millionth of a nanoGauss)? What trick can you use?? A very neat one, one that relies on physics not directly tested in any laboratory, here on Earth, and unlikely to be so tested during the lifetime of anyone reading this today – the production of positron-electron pairs when a high energy gamma ray photon collides with an infrared or microwave one (this can’t be tested in any laboratory, today, because we can’t make gamma rays of sufficiently high energy, and even if we could, they’d collide so rarely with infrared light or microwaves we’d have to wait centuries to see such a pair produced). But blazars produce copious quantities of TeV gamma rays, and in intergalactic space microwave photons are plentiful (that’s what the cosmic microwave background – CMB – is! ), and so too are far infrared ones. Having been produced, the positron and electron will interact with the CMB, local magnetic fields, other electrons and positrons, etc (the details are rather messy, but were basically worked out some time ago), with the net result that observations of distant, bright sources of TeV gamma rays can set lower limits on the strength of the IGM and ICM through which they travel. Several recent papers report results of such observations, using the Fermi Gamma-Ray Space Telescope, and the MAGIC telescope. So how strong are these magnetic fields? The various papers give different numbers, from greater than a few tenths of a femtoGauss to greater than a few femtoGauss. “The fact that they’ve put a lower bound on magnetic fields far out in intergalactic space, not associated with any galaxy or clusters, suggests that there really was some process that acted on very wide scales throughout the universe,” Zweibel says. And that process would have occurred in the early universe, not long after the Big Bang. “These magnetic fields could not have formed recently and would have to have formed in the primordial universe,” says Ruth Durrer, a theoretical physicist at the University of Geneva. 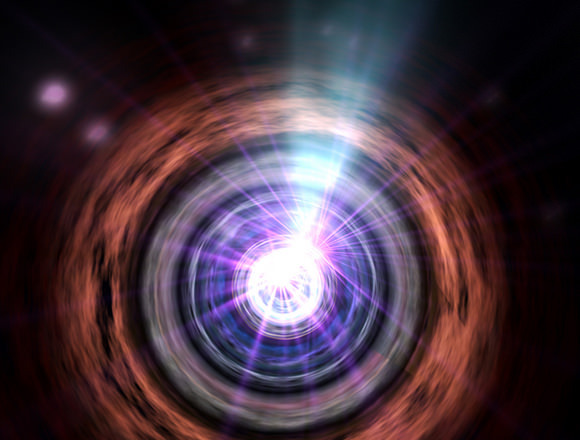 So, perhaps we have yet one more window into the physics of the early universe; hooray!